Last week at the Children of Haiti Project, a group of 6 teachers from the Cayman International school (CIS) volunteered and covered a range of subjects: English (ESL), Math, Science, through board games and hands on activities. The benefits of this type of learning experience will be long lasting as the acquired skills such as critical thinking, problem solving, and independent decision making are transferable from academic subjects to everyday life situations. 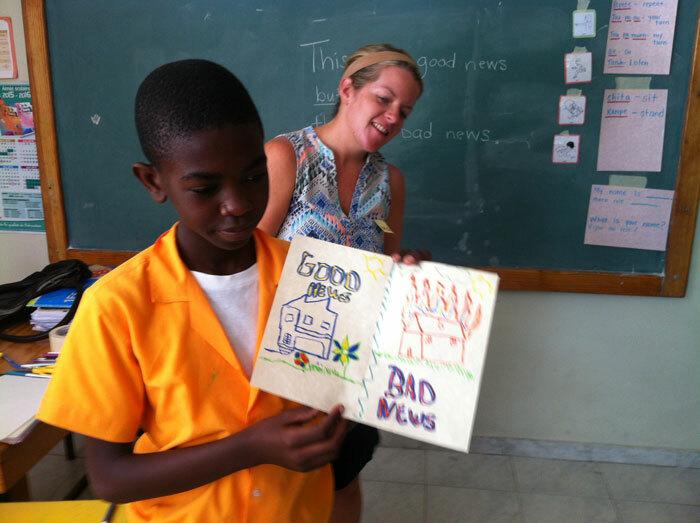 The Children of Haiti Project in the News! It’s Purple Cake Day at the Children of Haiti Project! The children celebrate this very special day in association with our partner, the Kenbe La Foundation - one of COHP’s biggest contributors and supporters. Double Trouble at the Children of Haiti Project! The twins, Nael and Nata have been with COHP since the very beginning in 2010, six years ago. At the time they were residing a tent camp for earthquake refugees. The Literacy Program students at the Children of Haiti Project Wood Workshop. This evolving group of 15 children at a time, between the ages of 8 and 14 have had no prior schooling. At COHP they are brought up to the 6th grade level and taught trade skills in order to be able to make a living. When they want to pursue their education beyond 6th grade, we support them.